Life-threatening health issues involving numerous surgeries and complications forced me to look for alternative solutions to my growing health problems. Immediately upon switching to a whole foods plant-based diet, the gastric pain I had been experiencing for months disappeared. This was a life changing revelation. Since then I’ve lost an impressive amount of weight, am no longer on any medications, and I no longer have acid reflux. These dramatic results led me down a path of learning and discovery. Upon completing Cornell’s plant-based certification program, I became certified through Wellness Inventory as a wellness coach. 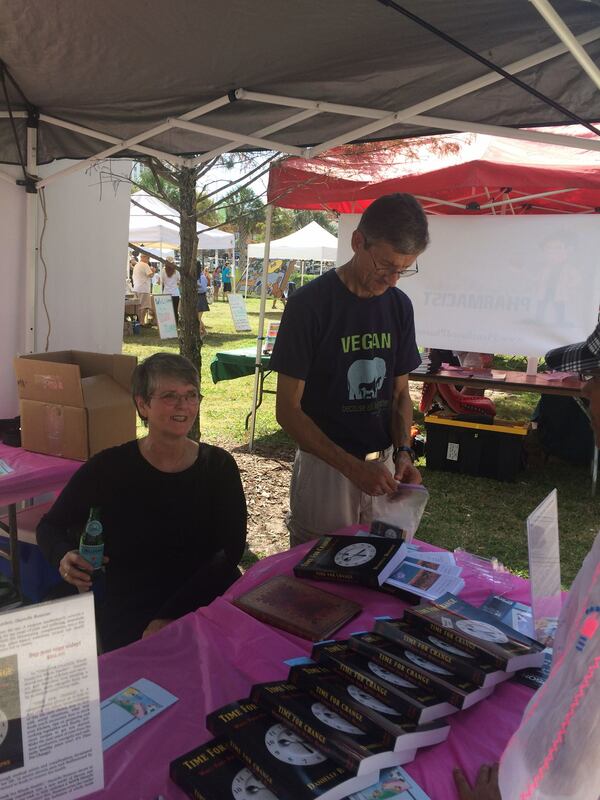 In Sep 2015, I was interviewed by Dr. LeAnne Campbell, founder and executive director of the Global Roots Program, a plant-based educational program in the Dominican Republic. 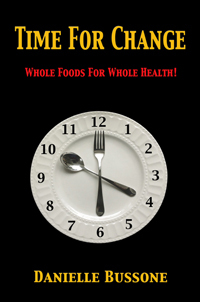 My book, Time For Change: Whole Foods For Whole Health is a comprehensive guide to transitioning to a plant-based lifestyle. It explains problems one might encounter along the way, new foods to explore, cooking tips and instructions, and includes plenty of plant-based recipes to get you started. It is also is a great overview of the current science of plant-based nutrition. Previously, I wrote a monthly book review column for a regional magazine in North Carolina. I serve as Press Liaison for High Country Writers and in my “spare” time I write fiction. I’ve been a professional artist for over 25 years. 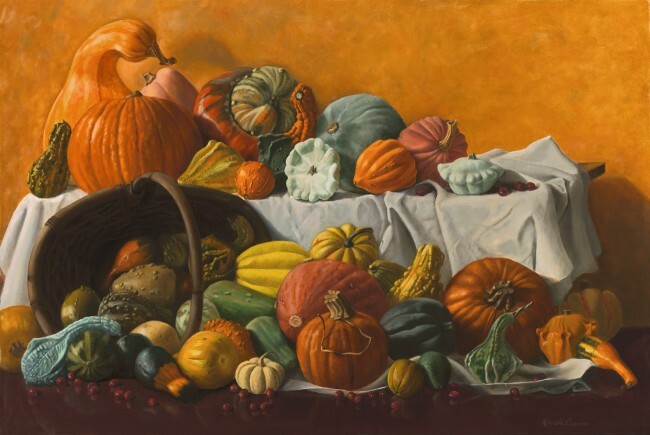 The images on our web pages are taken from my original work. My husband, Rich, is a dentist who retired from the Air Force in 2001. He handles all my technical web issues. Throughout my years of near-death experiences, Rich has been my rock and my advocate. I wouldn’t be alive today were it not for him. I can’t imagine a better husband and friend. He makes every day of my life a loving, joyful adventure. 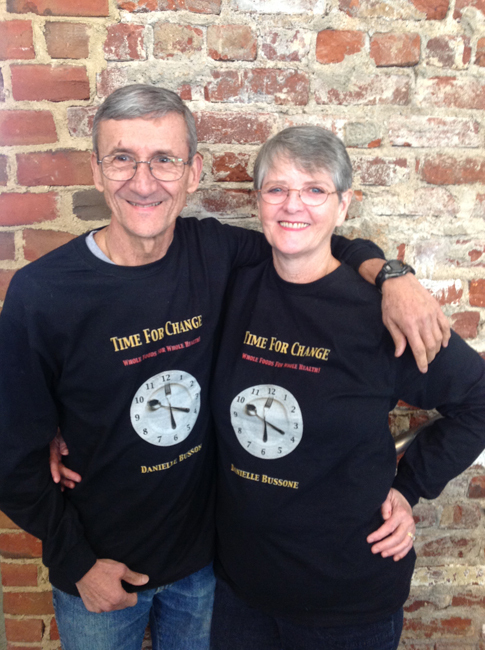 Rich & Danielle — The Time For Change Duo! Until recently we enjoyed sharing our life with four animals, whom we collectively refer to as our beloved “Monsters.” Sadly, we lost our dog, Camper, to liver disease we believe he contracted from eating dried chicken strips imported from China. (We purchased them at Sam’s Club). We found him in a campground 14 years ago when he was 5 months old. We named him “Happy Camper” and brought him home to live with us. The hole he has left in our hearts will never be filled. We are comforted by our remaining Monsters, Phoenix (an 12 year old, 85 lb. cross between a Samoyed and “some big red dog”), Tempest (a 14 year old gray female cat we stole from the pound when she was 5 weeks old), and D’Artagnan (our 10 year old kitty, who sports a mustache and goatee, whom we’ve had since he was 3 months old and is the sweetest little cuddle-bunny in the world). Our Monsters are our family and contribute immeasurably to our happiness. Coal — Our newest family member. We liberated her from the doghouse where she spent the first year and a half of her life. Now she is more likely to be found curled up in our bed! Monster update! In the spring of 2014 we adopted a 16-month-old, jet black pup (Coal) to our family of beloved Monsters. 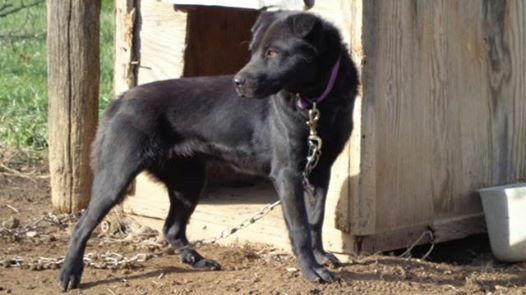 She had spent her entire life chained to a doghouse. We adopted her through Animal Defense League of Washington Co., who discovered her. Her mother is a Char Pei and her father is unknown. After getting to know her, we have decided her father must have been a Tasmanian Devil! She had some behavior issues to work out in the beginning, but she’s a smart little girl (23.5 lbs) and she quickly invaded our home and our hearts. Now at three years old, she has settled into our family and is happy and healthy. We hope to have her with us a very long time. I am Fanta from Atlanta Merkato Market,Ethiopian store . What an inspiring story Danielle, and how lucky your wonderful husband had been always there by your side. Don’t forget Cha Da Thai in Boone, and Hob Nob Cafe — or whatever its current name is! We have reviewed Hob Nobs (see post) and Cha Da Thai is in the process of being reviewed. Thanks for your comment! Hello! I’d like to know how to be listed on the site, I am opening a health food store and veg/vegan/raw restaurant in Damascus. Our other restaurant Blue Blaze Cafe also offers vegetarian dishes. Our pasta company creates vegan fettucine as well. Please be in touch, I enjoyed reading your story! It’s very easy to make and so good!! Congratulations, Danielle, on figuring out a way to become more healthy and for letting the rest of us read about your story. Love the restaurant reviews and other places travelers can visit. Thanks, Maggie! I love your blog as well: http://damesofdialogue.wordpress.com I hope others will check it out! !